When did you know that you wanted to make fashion? I recall about 9 years ago. I was in this crazy crafty mode where I would buy shirts at Gabriel Brothers…take them home and “improve” them. I always wondered why good clothes had to be so damn expensive. I think there are a lot of women out there who feel the same. Perhaps they don’t take out their scissors and rip up new shirts. But it was not until 2007 that I realized I could actually be part of making fashion happen. It was at that time that my partner Subu, who is the M641 Creative and Design Director, asked me to take on the building of our very own brand. What do you wear on Sundays? Sundays, Mondays, Tuesdays….pajamas! That is one of the benefits of working from home. Not exactly pajamas, more lounge wear. Oh or workout wear like tracksuits and t-shirts…just in case the workout bug bites me! Exciting huh? Right about 4PM then it’s coffee time for M641! Usually my partner Subu and I get really motivated about that time of day and can sit down and focus on the next half of the day! We are inspired by women of all walks of life and the various roles we play: mother, wife, socialite, businesswoman, traveler, etc. Our biggest inspiration was a need in the market to make available high end designer fashion at affordable prices. Additionally, we wanted to serve the market and strike a balance between styles that are overly trendy and those that are overly ethnic. While we take into consideration the trend forecasts, we don’t let them dictate our collections from season to season. This answer is going to be all over the board! People in this industry who don’t respond to you! Fast fashion and what it does to our environment. People who are not open to new emerging talent. The high prices of designer wear…which is really just inflated operational costs being passed on to the end-consumer. Simpatico…look for it to be used somewhere around Summer ’09…wink wink. Talk to me about the state of fashion and where you think you fit in. I’m actually pretty concerned about “fashion” today. Many people cannot see past trends to consider that the clothes you buy make a big impact…either positively or negatively. Fashion actually has a profound effect on our economy and politics believe it or not. We shouldn’t forget the impact it has on our environment and our culture as a people. Most definitely our value added is the affordability of our goods. Also, we’re proud of the fact that M641 brand is not overly trendy, which means it won’t go out of fashion anytime soon. We design all of our pieces in the highest quality 100% woven cotton which washes extremely well and is often wearable from season to season. Our customers report that they do not get tired of wearing our designs which hopefully means that they’ll remain in your wardrobe longer than one season. Absolutely! It was to Caramel – a great boutique in Washington, DC. That was an exciting time…I remember the chain of phone calls to the members of our team. We discussed the logistics of getting the order out, which pieces were selected, etc. We get those feelings back every time she re-orders too! She’s been a great repeat customer and one whom we will ALWAYS remember. What excites you the most in the next 6 months? Looking forward to an improvement in our overall economy! But on the bright side of this downturn, people are scrutinizing their spending and thus not shopping as much at mass retailers. Our focus has always been to bring our label to the boutique market. We are able to offer an affordable brand at that is both memorable and sustainable. I’m hoping more consumers start buying local and indie. What has been the most challenging thing about your job? Scheduling…on all fronts. My partner and I are moms in our “real-life”. So to juggle working in the daytime and providing for a child can be tricky. In terms of the challenge of running each Collection…it’s all the scheduling of not only our time, but the design process (allowing for ample creativity and research of trends) the sampling team’s timeline, photography (stylizing, model search etc), creation of marketing materials, and just when you’re ready for a breather…SELLING season! Then when you think it’s time to take a break…guess what, it’s time to work on the next season’s Collection! We’re glad you enjoyed seeing Spring ’09. The goal was to remain simple and soulful while keeping with or niche of subtle luxury trims and touches! Hence the “Posh Nomads” as our Collection title. We’re even more thrilled with Summer ’09 which will be utterly sensuous. Yes, past, present and future…I hope we can bring you more of the same…and better! By the way your photo shoots are on point. Nice work. Thank you! But thanks to Taschka Turnquist who hails from NYC/LA. Most of the time I can share our worksheets with her prior to sampling, give her a particular collection’s theme…and she just gets it — spot on! Moose Tracks! Oh those little frozen cups of chocolate heaven. Are we done with the Q&A yet? Is music an influence in your creations? For sure…we range from listening to Indian Classical scores to something like Muse when putting on a Fashion Show. Dance is certainly an influence in our designs. Subu our Design Director has studied, teaches and practices Indian Classical Dance. This is “instrumental” in her vision of our line. The dance she performs is the embodiment of femininity and gracefulness. This is a true art form and is also very communicative of one’s emotions. We hope that you’ll indentify these qualities in the M641Collections. I call on everyone in this industry…What can you do to better the state of fashion today? I can keep moving forward. Artists are at the heart of fashion; as long as I stay creative and show others the value of style I will have an impact. @M641 you have made an impact on me. I can’t wait to see what you have in store for us this summer. 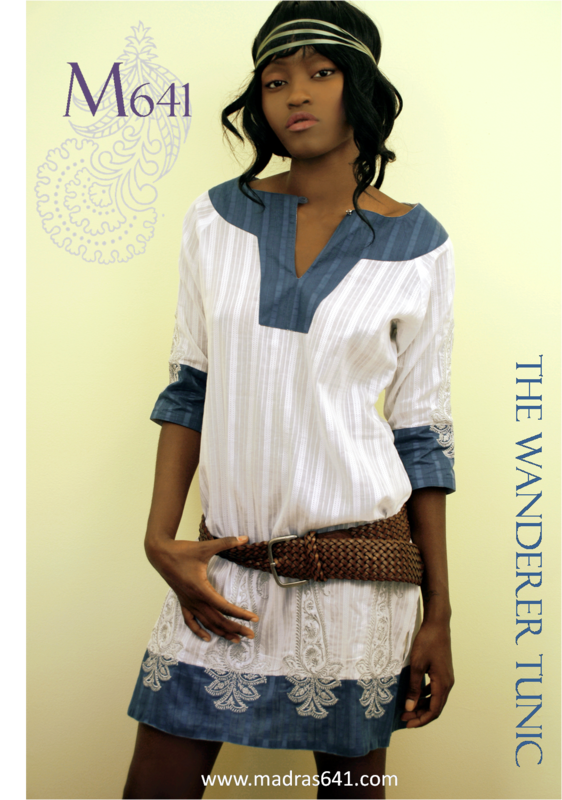 Check out Ina and the M641 Collections at http://www.madras641.com. This entry was posted in Fashion, Twitter and tagged Fashion, M641, Twitter. Bookmark the permalink. I apologize for the informality here but all Anne gave me was your blog address and I couldnt find an email link. Maybe you are trying to stay elusive, and in that case… it worked 😉 haha. Anyway, please feel free to shoot me an email at shyla@shylaphotography.com. Awesome interview! Now I am going to go check out the collection!